﻿﻿﻿﻿﻿﻿﻿﻿﻿﻿﻿﻿﻿﻿﻿﻿﻿﻿﻿﻿﻿﻿﻿Looking for Yamdu alternatives? StudioBinder provides a video and film production management software for agencies﻿, indies studios. Read the full Yamdu review and comparison below. The first major difference between Yamdu and StudioBinder’s software for film production: call sheets. The call sheet is one of the most critical components of a production. Yamdu’s call sheet interface is clunky in appearance, and so unfamiliar in layout that it would confuse most talent and crew. All of StudioBinder’s templates follow time-tested industry standards. You can also select from any of three call sheet templates. Yamdu's Cal﻿﻿l﻿﻿ Sheet Builder. Rather dark and non-standard in its layout. 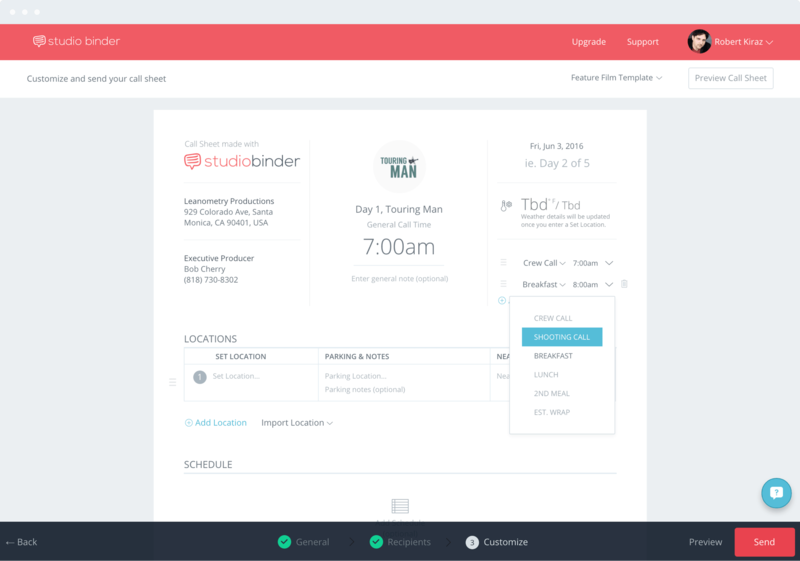 StudioBinder's Call Sheet Builder treks more familiar ground for industry professionals. Beyond its quirky appearance, populating a call sheet in Yamdu is non-intuitive and generally takes more time than simply filling in a spreadsheet. The time drain alone can be a major disqualifier when seeking film production software that actually saves you time. StudioBinder provides a robust Call Sheet Builder to create complex, professional call sheets in a fraction of the time. Everything is laid out where it should be, and we auto-populate weather, map links, recipients, and more. 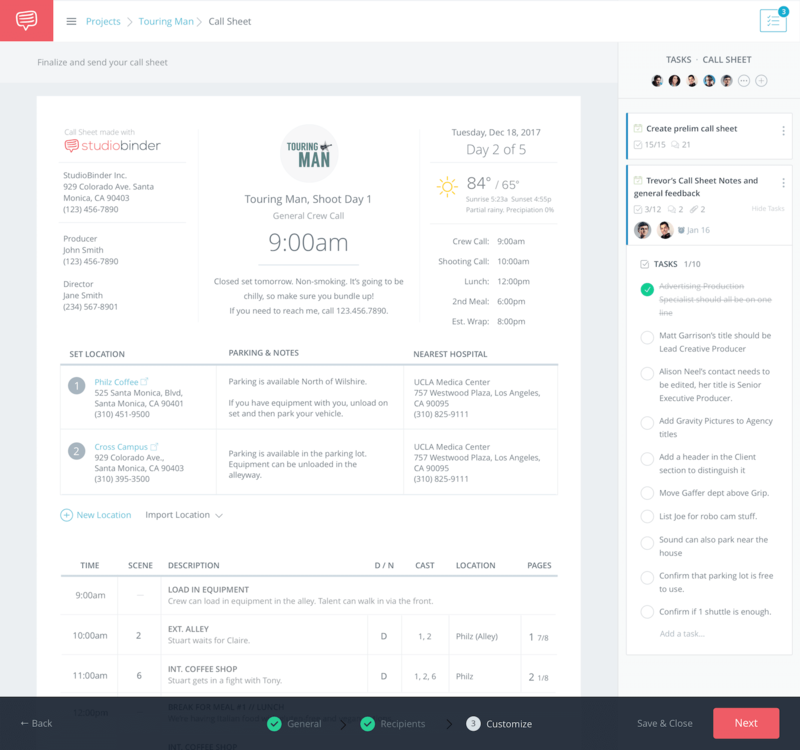 Yamdu creates generic call sheet PDFs, similar to a spreadsheet. When call sheets are generic, it forces talent and crew to download dense PDF files, and fish for the details that pertain to them. In most cases, this is data overload for most talent and crew. It often results in confusion, misreading tiny-sized fonts, or completely missing key details. 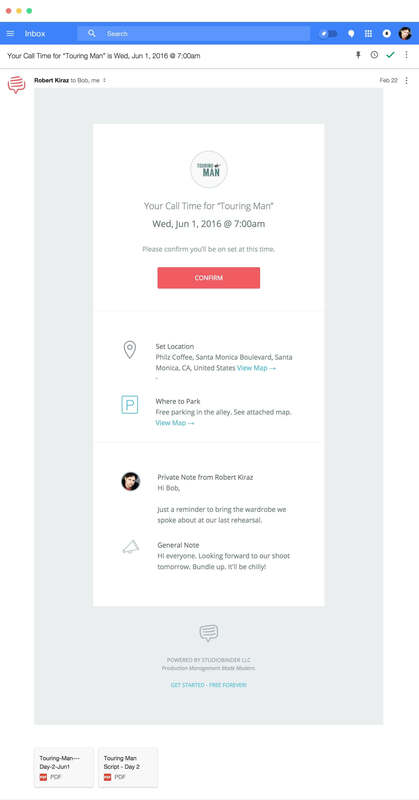 StudioBinder’s film software not only allows you to create a call sheet, but it also generates a personalized, mobile-friendly email digest for every recipient. Each tailored email highlights only the details that matter to the recipient so you can be sure key information is communicated clearly. Although we still attach a PDF of the call sheet to every email, most talent and crew faraway prefer personalized emails. Each personalized call sheet email features a “Confirm” button so that the production knows which talent and crew have received the call sheet. Talent & crew do not need StudioBinder accounts to view and confirm their call sheets. StudioBinder empowers you to track the status, views and confirmations of a call sheet. Because Yamdu does not send personalized emails, they can not provide an interface to track status, so you have to stay in the dark after emailing out call sheets. That, or call every recipient one-by-one to confirm receipt. 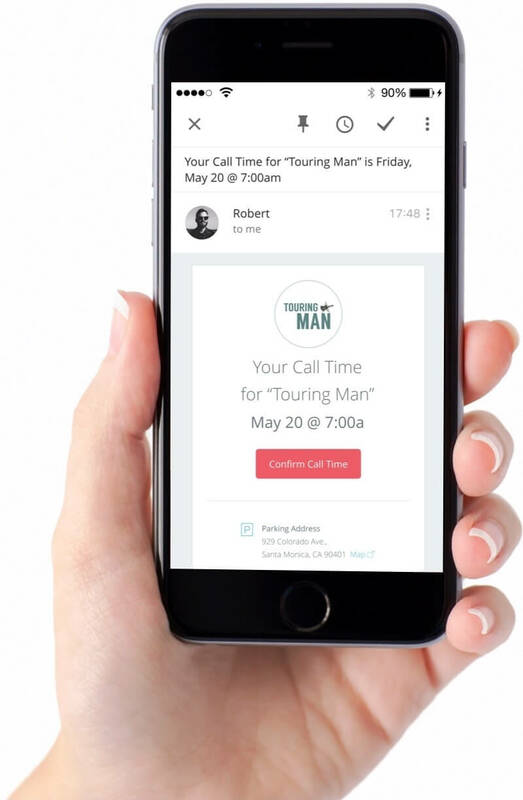 Bottomline, talent and crew get a better call sheet experience. And you gain visibility on status. 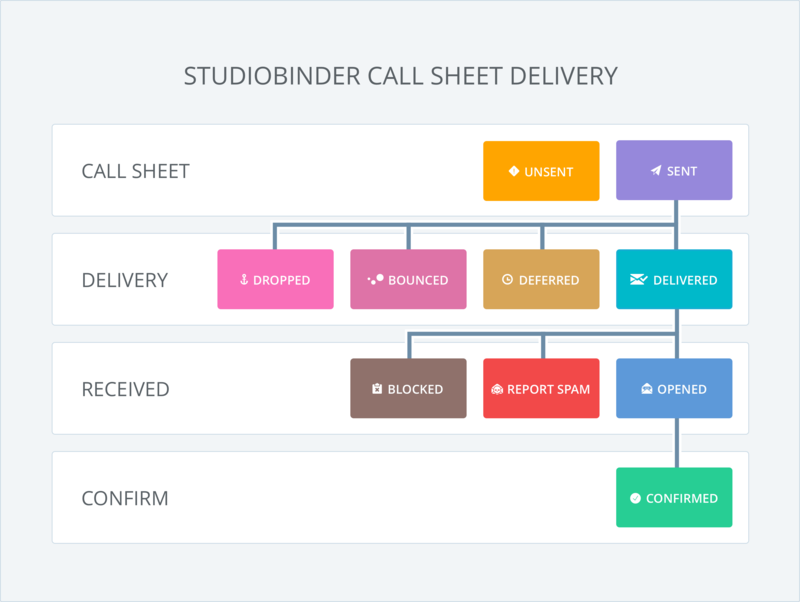 For peace-of-mind, track fine-grain delivery status for every call sheet sent with StudioBinder. View the status of every call sheet. Create & assign tasks for team accountability. 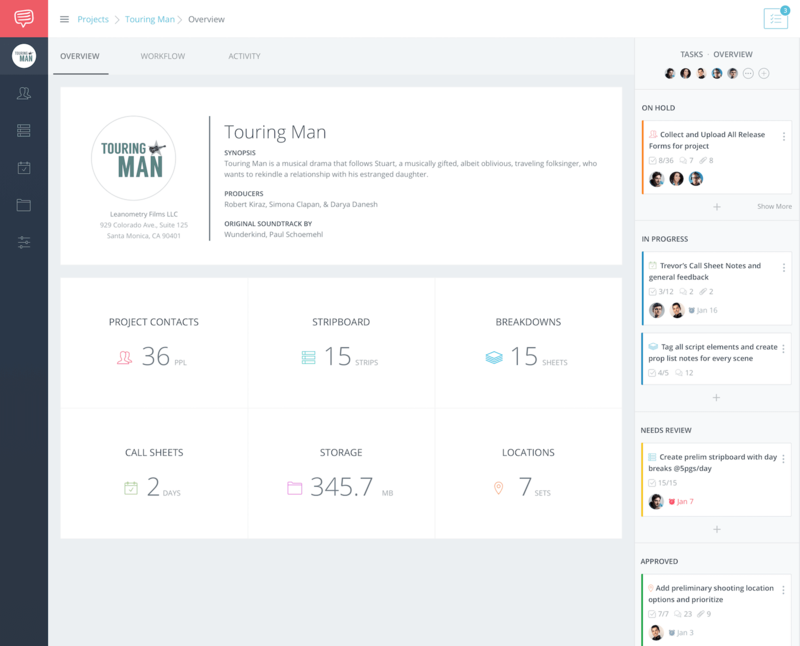 StudioBinder was created with film project management and collaboration in mind. Similar to Yamdu, you can easily invite team members to help contribute to projects. Assign checklists, add deadlines, post comments, etc. The difference: StudioBinder provides a section on every page to create tasks in context, whereas Yamdu forces users into a disconnected “Tasks” page. We think it more valuable for team members to see (and check off ) the tasks while on the relevant page (i.e. call sheet, stripboard, breakdown sheet, etc.). Furthermore, StudioBinder aggregates all of the open tasks on team members’ dashboards so they’ll always have an understanding of their pending tasks as soon as they enter a project. StudioBinder enables you to add and check off todo's in context. A call sheet in this case. 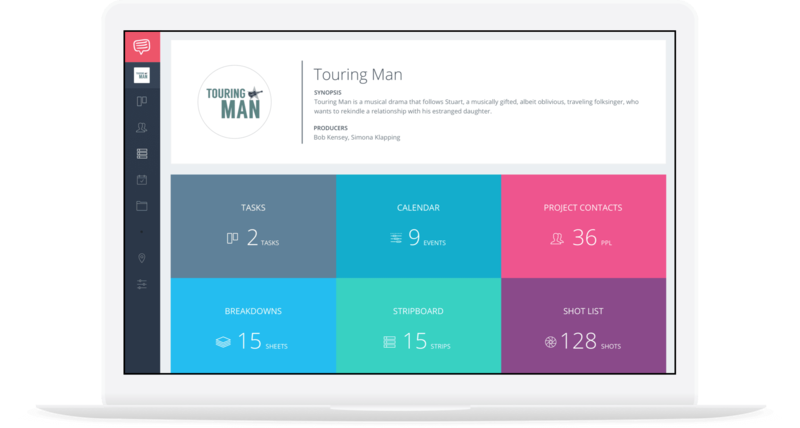 StudioBinder's Overview page aggregates all project tasks across multiple pages into a single sidebar. 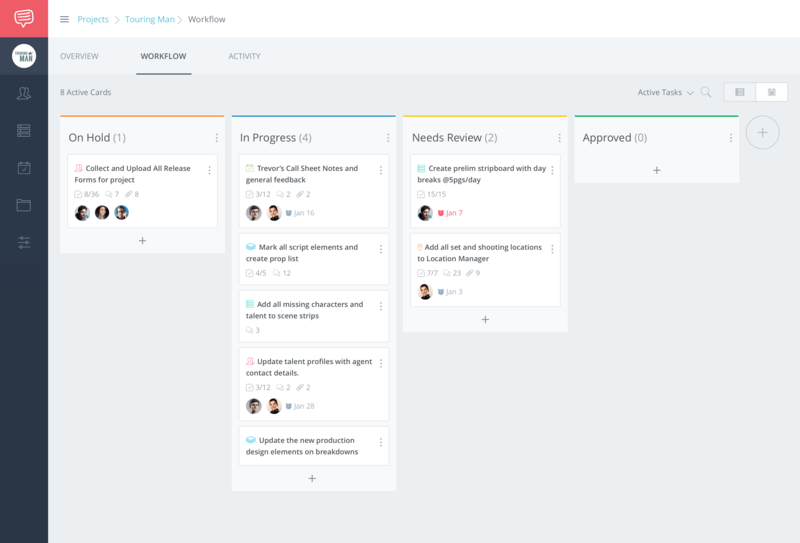 Workflows provide visibility on progress. Yamdu’s production manager tools and features fall short when providing a top-down view of the overall status of a project. Their interface is quite dark, dreary, and difficult to follow at scale, but don’t take our word for it. Yamdu's Tasks page falls short on conveying progress. In comparison, StudioBinder much brighter, more uplifting film management software lays out all of a project’s tasks into cards. Those cards can be organized into workflow columns that represent the status of the card. At a quick glance you’ll be able to understand the phases work, who is working on what, if there are bottlenecks, who has free time, etc. You can even customize the layout to match your film production’s workflow. 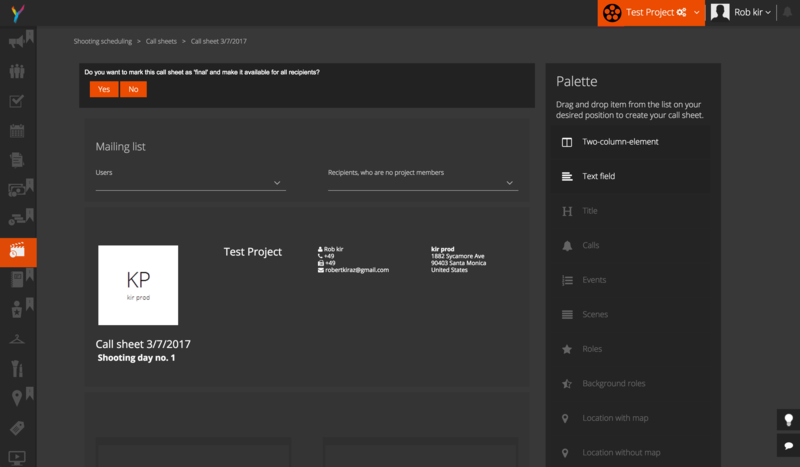 StudioBinder's Workflow page showcases the status of task cards, and surfaces bottlenecks. StudioBinder makes it much easier for you to understand the status of every task, at a glance. Work better, together. Join 30,000 production companies, studios, and video agencies that are optimizing their production workflows. 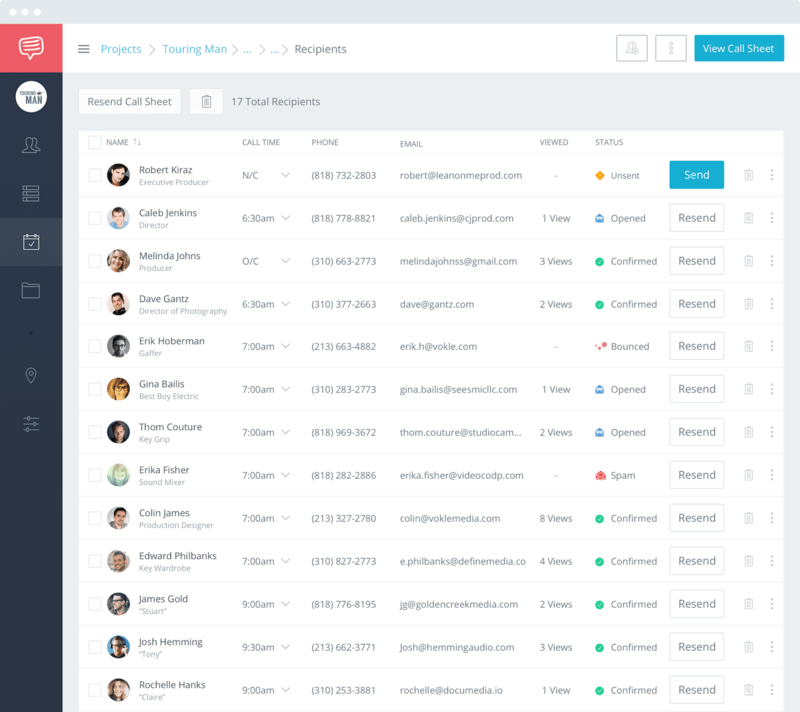 Organize production contacts in one place. Unlike Yamadu, StudioBinder puts much greater emphasis on managing productions contacts such as talent, crew, executives, clients, extras, etc. It does this by creating a master Contact book where all of your contact details are stored. 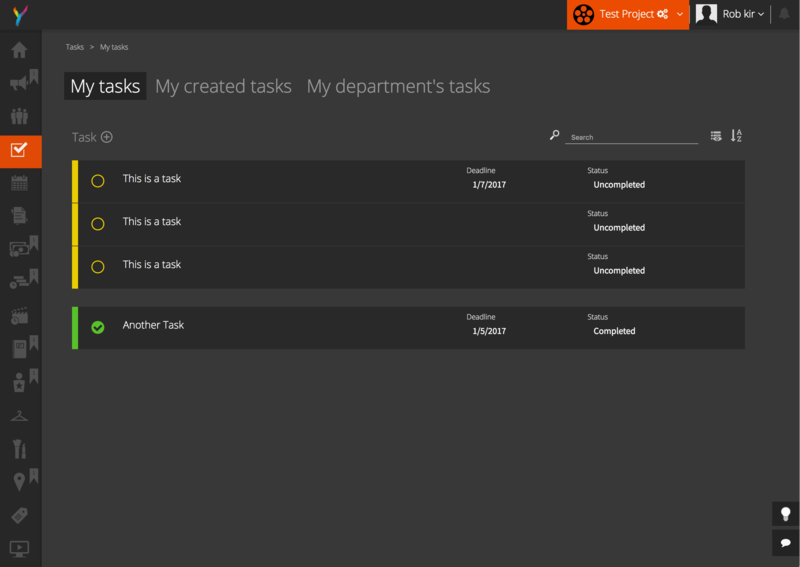 You can assign those contacts into projects. This very helpful if you find yourself working with the same talent or crew. Enter rich metadata such as dietary needs, contact details, rates, etc. Upload production files such as deal memos, release forms, tax forms, etc. Bucket film crew into custom lists. Treating production ﻿emails﻿ like support tickets. 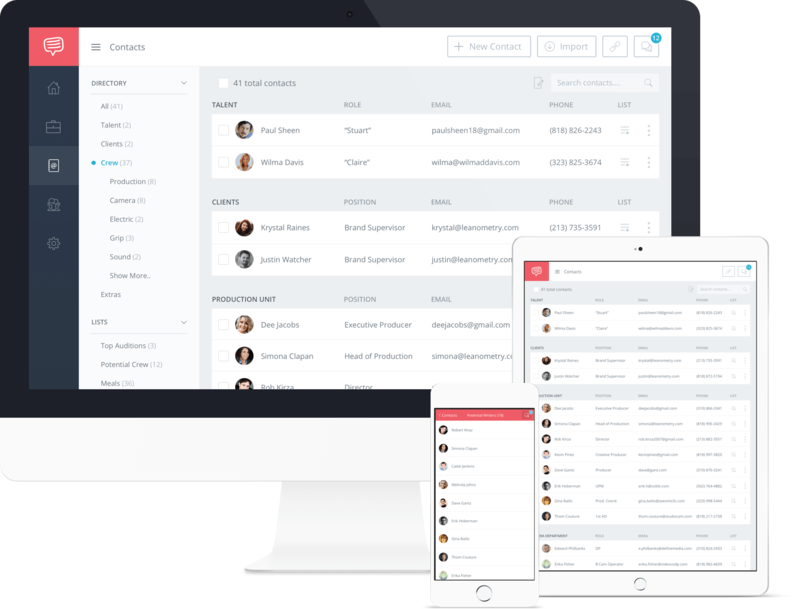 StudioBinder’s software for film production doesn’t stop at contact management. You can also message contacts right within StudioBinder. We believe that a productive team is an informed team. To keep your team in the loop, we provide a unified team inbox where all open production emails are organized, ready for response. As soon as someone from your team replies to a production inquiry, they can “close” an open conversation, similar to closing a support ticket. This ensures that your team stays on top of pending communications, and work together to relay information efficiently and promptly. Yamdu’s film production software does not offer team inbox functionality. StudioBinder is more intuitive than Yamdu. Tired of having to struggle your way through clunky designs and convoluted menus? We’re not sure why simple actions require 5+ clicks in Yamdu. We don’t know why Yamdu forces you into a 9 step wizard when creating new projects, or why every page load takes 4-7 seconds to slowly animate in. Odd user experience choices can be found everywhere you turn in Yamdu. With StudioBinder, the user experience is streamlined, modern and intuitive. No training is required and pages loads fast and snappy. You’ll also get more film and video production management features than Yamdu without having to navigate a maze of convoluted designs. Actually saves money as you use it. StudioBinder’s film & video project management software not only requires less training to get started. It also means you can get the job done faster and wrap earlier every day. When software for production is poorly designed, it adds hours of wasted time to your workflow. Multiply that by team members…that’s a lot of lost productivity to pay for. Yamdu charges nearly $50 per project. Want unlimited projects? Be prepared to spend up to $550 per month. Paying up front just to access film production software is a dated notion. StudioBinder offers a free plan so you can test drive all of its core functionality with zero risk. Like what you see? It’s a few clicks to upgrade and unlock its full functionality. Pay monthly, upgrade or downgrade as you like, all at a fraction of the price. None of this “per project” nonsense. We don’t believe in punishing users every time they secure a new project. StudioBinder also offers an annual pricing if you’d rather pay once every 12 months. Pay for the whole year and get a discounted rate. Is there any desktop software to install? Why StudioBinder is the best alternative to Yamdu. The short version? StudioBinder is better for studios, video agencies and production companies who want a more intuitive all-in-one solution. StudioBinder’s film production management software provides much better project management insights into the state of a project; from call sheet delivery status to smarter task workflows for teams. The Yamdu is better if you want document generator. Meet the best alternative to Yamdu.